If there’s one thing I dread when biking for long distances, it’s a headwind. I find headwinds totally demoralising. Headwinds make you isolated, you can’t hear much except the wind blasting past your ears. Moving forward is a battle and what would normally be a pleasant ride is drawn out into an excruciating form of torture where time stands still. 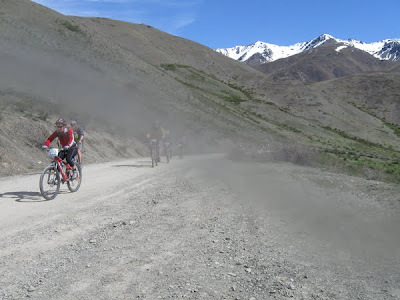 With this in mind I was worried about the weather for the Muster, there was talk of a southerly change, and a southerly is a headwind when riding the 80kms from Molesworth Station to Hanmer. A headwind the whole way. Taking some very good advice I put all thoughts of wind and weather out of my mind as I prepared for the trip north. 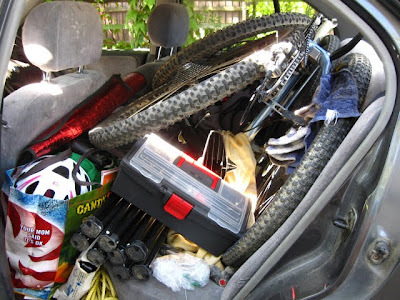 Food, clothes, camping equipment, tools and bike were checked and rechecked and then loaded into the car. 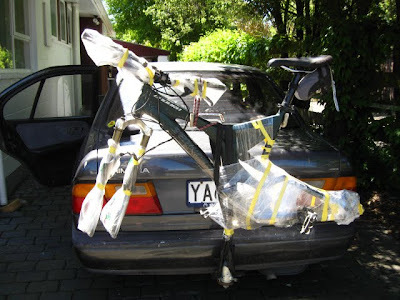 My lovely hubby’s bike drew the short straw and had to travel on the back of the car which meant it got to be mummified in plastic to protect it from the dust. Then we were off. This year’s journey was much more pleasant and relaxing, with no snow or bad weather to freak me out, although having some air-con in the car would be a good thing. Just lots of glorious sun. 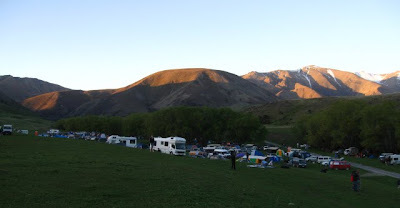 We made good time and had the tent and dinner cooking in the day light and then hooned about the camp on our bikes and took pictures of the stunning sun set. Molesworth Station is truly a gorgeous piece of New Zealand. 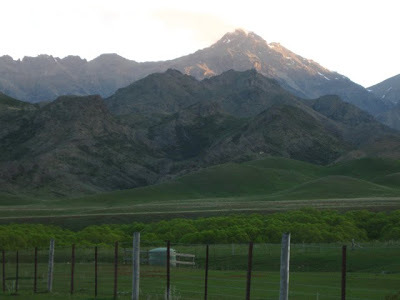 Surrounded on all sides by towering mountain ranges, with deserted stretches of flats and beautiful emerald rivers flowing through it. The air is so clean and sweet, perfumed with rose-hips and the sky is a canvas of blue with amazing cloud paintings ever changing above the landscape. 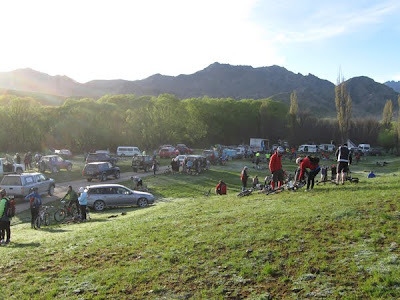 We are very lucky that the generous owner of Molesworth station loves to share this place with cyclists. As the sun disappeared a white horse galloped across the ridgeline in front of me and being the superstitious type I took this lovely sight as a good omen. Soon after we retired into our cocoon of duvets in our wee tent and snuggled down to a warm night’s sleep. In the morning there was a light coating of frost on the outside of the tent, but not on the inside like last year, and I was feeling well rested and nervously excited. Breakfast and V were wolfed down and the car hurriedly packed and hubby was off on the journey back to Hanmer. As I sat on the hill watching the chaos of the departing cars and trying to get my toes warm I knew I was ready for the race and I was resigned to a headwind. A little aside to put the Molesworth headwind into perspective. The headwind is cold, being a southerly and unremitting. For the fastest riders it means about 30mins extra on their time. That’s about 10mins extra for every hour on the bike. So if you’re super fast and did it in 2hrs 30mins last year, you could expect to do it in 3hrs this year. I hadn’t worked this out till after the race, but this wind meant I was in for an extra hour of riding. I’m glad I didn’t work it out till after the race, it would have been rather disheartening on the start line to know that. I met up with Amy Laird and her mother waiting for the start and had a chat which was good for calming the nerves and in no time we were off on the 1.5km rolling start. Up the first pinch and Mrs Laird was gone in a cloud of dust. I see where Amy gets her biking legs from! Knowing what to expect this year made a huge difference. I eased into the first 10kms, did quite a bit of drafting to keep out of the wind and just focussed on finding a nice rhythm over the rollers. I very carefully crossed the ford just before Ward’s Pass and managed to keep my feet pretty dry. Objective 1, check. Up Ward’s Pass I settled into a nice slow spin. Quite a few people went blasting past early on, but this didn’t worry me. Most of them blew up half way up and had to push, but I just kept pedalling. In fact I really enjoyed the climb. I could have pushed harder, but that wouldn’t have been clever so early on in the race. My whole attitude to hills has changed a lot and now I quite enjoy the challenge of controlling the pain. At the top I decided my feet were dry enough to blast down the other side without stopping and find some people to latch onto for the haul across Isolated Flat. My speed down the hill meant I caught up to some nice big men who provided excellent shelter from the wind. It was now, though, that I began to realise what a difference this wind was going to make. Last year I was blasting across the flat in a small bunch of women at 30kph, this year, with big burly men to drag me on we were lucky to reach 22kph. I managed to leap frog from one bunch to another faster bunch regularly across the flat and was feeling good as we forded another stream and I kept my feet dry again. I was really glad to be wearing my woolie socks. Up the next big climb to Isolated Saddle and I was feeling good enough to pose for the race photographer before quickly pulling over to remove my damp cotton socks from under my woolie socks and replace them with a pair of dry merino socks. Now I had two pairs of warm wool on and was ready to take on the chilly and fast descent down the other side. Through the river valley was gorgeous and the next 20kms ground by pretty well. I was drafting as often as I could and concentrated on keeping my pedal stoke clean. At the 40 km point I made my next and last planned stop to eat lunch and massage some circulation back into my feet. I also donned my leg warmers as the chilly southerly showed no signs of abating and I wasn’t going to make the same mistake as last year. After resupplying my pockets with muesli bars and plenty of lollies for the last 10kms I headed off with a bunch of people and tucked in. Up any of the many small climbs they would pull away, but I ended up passing them again going down the other side. Soon I was battling the wind alone and hoping to catch onto someone. I did manage to hook onto the back of a lovely English woman. We chatted for a while and she was happy for me to tuck in behind her when the wind got nasty. We cruised along chatting and riding for a while and then I said goodbye as she headed up a hill faster than I could follow. On I pedalled into the wind. Feeling a little disheartened that my speedo said I’d been riding for 3hr 30mins and I hadn’t reached the 60k mark yet. My spirits were lifted greatly as I passed the first spot where I had to stop and rest last year, when I was going through my “ride 30mins for a rest ordeal”. No stopping this year. My legs were definitely hurting but nothing I couldn’t ride through. My biggest worry was the consistent ache in my left knee and my lower back. In fact my knee had got so bad that I couldn’t put any decent power through it and when I stood to pedal and give my leg muscles a change of pace it was agony (no pun intended). Down the hill past Accommodation House and then across the Clarence river, I caught up with quite a few people who had passed me on the climb. I keep hoping that the wind would die down and the promised change to nor-easterly would happen, but to no avail. I was really hurting now, but managed to hook onto a large bunch working well and going at a good pace. They got me through the next 7kms and then I knew I could make it without stopping no matter how bad my legs felt. I knew there were two more nasty little climbs before Jollies Pass and I just spun up them slow and steady, passing those who attacked the climb at the start and then had to walk. On the downsides I was flying, taking the chance to stand and stretch my back and work my thigh muscles. And then the turn off to Jollies was just ahead. I was stoked. I knew this next bit would hurt, but I also knew exactly what I was in for from riding it two weeks ago. I managed to occasionally find some shelter behind the Tui team, who I’d been seeing on and off since the start. This was a mixed blessing. On the one hand they were nice big guys who didn’t mind me drafting them, on the other hand they were wearing white lycra which was more than a little see through by the end. I watched in horror as they attacked the last ford and got soaked. It was too much for my eyes and I let them get away as I spun up the last climb. And then all the climbing was done and the best part of the whole ride was in front of me. I let out a whoop of joy and released me front forks and took off. It felt so good. All those painful kilometres that I’d ridden to get to this point melted away. I was flying, completely in control and focussed on going fast and staying safe. I blew past people like they were standing still, laughing and grinning. My tyres were glued to the shingle and I took each corner at speed. In no time I was down the hill and smashing the pedals. 30kph along the grass and I zoomed past the Tui boys. The onto the singletrack where I had to line up, I rode it this year and almost ran over a small child crossing the narrow bridge at the bottom. Up a steep tight pinch and then I could see my amazing husband waiting for me. I grinned and waved and wanted to smash it across the line, but there were too many people in front of me. I was broken, but so happy. My speedo said I had 5hrs 24mins of riding and my finishing time was 5hrs 33mins. 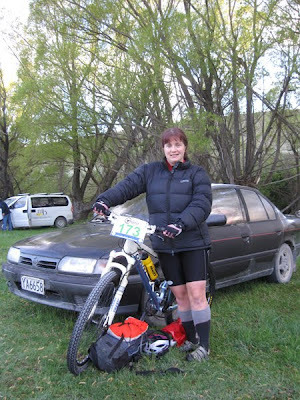 I finished in 18th place, ahead of 11 other women in my category and 120 other riders. If conditions had been the same at last year I would have finished in around 4 and a half hours! I hurt bad today. I really did push my pain boundaries again, it seems every time I push them I find new levels that I can ride through. I don’t think I’ll do the Molesworth again, I’m completely happy with how it went, it’s time for a new challenge.